Adhesive system for instant 'v' groove assembly. 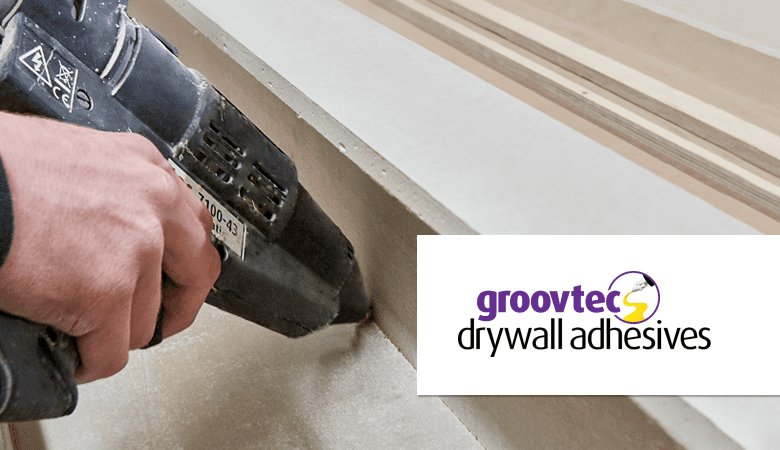 Groovtec adhesives are the fastest and easiest way to assemble v-grooved profiles in plasterboard for drywall installations. Suitable for use both on site and in pre-fab workshops the groovtec hot melt adhesive is applied into the base of the ‘v’ groove and sets instantly when the plasterboard is folded. No clamps or drying time is required. The adhesive sets to produce a bond that is stronger than the plasterboard itself and easily withstands transport, handling and installation. The groovtec system offers a range of benefits over tradition ‘v’ groove joining methods. Groovtec adhesive can be quickly and accurately applied using a TEC industrial glue gun and the hot melt sets almost instantly when the plasterboard is folded – there’s absolutely no clamping or drying time required. Unused glue in the tool is ready to use the next day, so there’s no material waste and no financial loss. Groovtec doesn’t require a primer to be applied to work, just apply the adhesive straight into the ‘v’ groove. Our ‘v’ groove adhesive is solvent free making it safe and easy to use and it doesn’t have a shelf life, meaning there’s no rush to use it by a certain time, and no chance that it goes to waste. The system allows decreased downtime, due to zero waiting once the tool is sufficiently heated, the adhesive will melt on demand when the trigger is pulled. Additionally, the fast application of adhesive allows much quicker bonding of the ‘v’ groove, granting increased productivity.